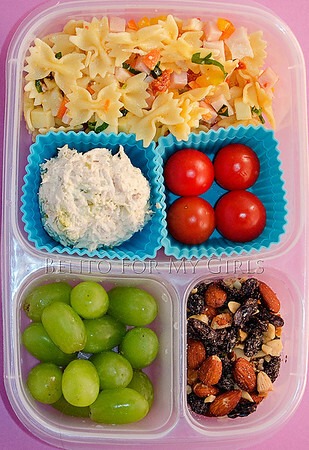 In your lunch box: Rainbows and Butterflies pasta salad. The "rainbow" is yellow peppers, carrots, sun dried tomatoes, spinach, ham, turkey and cheddar cheese. The "butterflies" are mini bow tie pasta dressed with a little bit of the oil from the sun dried tomatoes. She also has a scoop of tuna & pickles, cherry tomatoes, grapes and some trail mix.